With a growing need for understanding the process involved in producing and perceiving spoken language, this timely publication answers these questions in an accessible reference. Containing material resulting from many years’ teaching and research, Speech Synthesis provides a complete account of the theory of speech. By bringing together the common goals and methods of speech synthesis into a single resource, the book will lead the way towards a comprehensive view of the process involved in human speech. The book includes applications in speech technology and speech synthesis. It is ideal for intermediate students of linguistics and phonetics who wish to proceed further, as well as researchers and engineers in telecommunications working in speech technology and speech synthesis who need a comprehensive overview of the field and who wish to gain an understanding of the objectives and achievements of the study of speech production and perception. 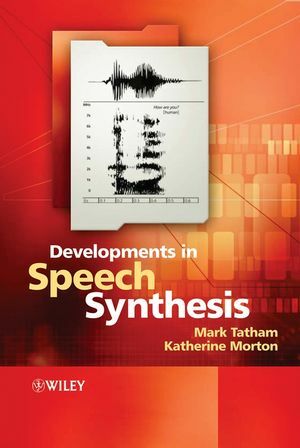 Mark Tatham is the author of Developments in Speech Synthesis, published by Wiley. Katherine Morton is the author of Developments in Speech Synthesis, published by Wiley.